Valentine’s Day Event has started. The following Laventia related event items will be removed during maintenance. The Wish Lantern series of items will be removed during maintenance on Feb. 15th. Vast Ocean Rescue system has been added. [Loyalties] Old Moon Distress Call item can be purchased in the loyalty shop. Use the flare to send a distress signal for rescue. [Loyalties] Old Moon Distress Call item can only be used in the vast ocean. When [Loyalties] Old Moon Distress Call is used a rescue boat will be summoned to your location. Get on the rescue boat and interact with the NPC to begin the transportation to either Port Ratt or Lema Island (whichever is closer). If you log out or move to the character select screen during the rescue phase, the rescue will be cancelled. If a rescue boat has been neglected for a long time, the rescue will be cancelled and will not return. If the player and rescue boat are 100m or more farther apart for more than 10 minutes, the rescue will be cancelled.. The following items have been added to the Loyalty Shop. 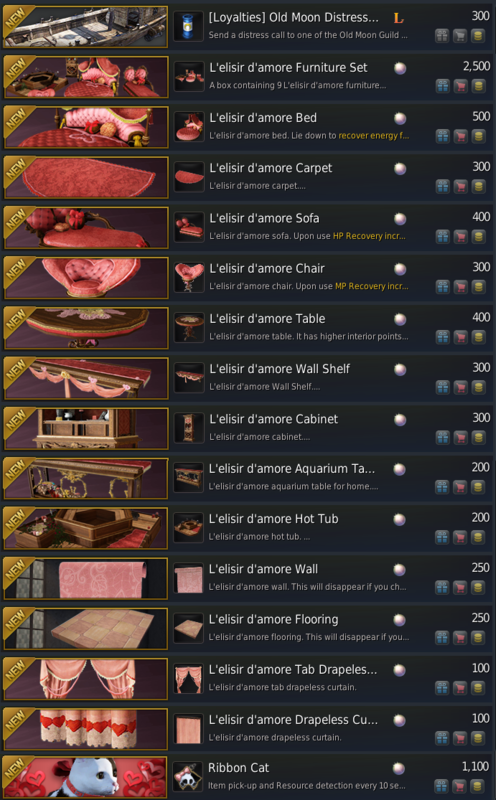 The following Valentine themed items have been added to the Pearl Shop. Valentine Table has a fish tank that has tropical fish swimming effects you can enjoy watching. Valentine’s Limited pet “Ribbon Cat” has been added to the Pearl Shop until Feb. 22nd. Tier 1 ~ Tier 4 each has a different appearance. The default skill for a tier 1 ribbon cat is finds resources and life EXP increase. These cats have a love themed effect. The effect will be activated during idle, walk, and run statuses. Golden Treasure Chests have been added to the sea floor. Users who cheat/abuse the Tier system in Horse Race will be disqualified. Black Stone (Armor) drop rate for monsters in the following Calpheon and Mediah regions has been slightly increased. Additional Cyclops have been added to the Cyclops Land. Lustrous Feathers dropped by Harpies and Masked Owls in the Calpheon region have a new return quest associated with the item. Norma Leight (NPC) at Northern Plantation and Loria at Florin town can exchange 100 Lustrous Feathers for 85,000 Silver. Red Nose’s Blade Shard, Giath’s Mask Fragment, Bheg’s Iron Mace Fragment which are collected from Black Spirit’s Daily Scroll Quests (Red Nose, Dastard Bheg, Giath) can now be exchanged for Gold Ingots. 200 of each of the items can be exchanged for Gold Ingot 1G at Western Guard Camp. Loot drops from monsters in Balenos, Serendia, Calpheon, Mediah regions have been decreased in weight by 50%. There was an issue while gathering Granite during the [Gathering Advancement Lv34] ‘Gone With the Fire’ quest, it read that Powder of Flame was also gatherable when it was actually not possible. This text issue has been corrected. ‘Black Spirit’s Adventure’ sound effects volume can now be adjusted. You can control the volume from this menu option. Pearl Shop item [Jukebox] Winter Night in Velia’s fireworks effects has been fixed to show the full explosion. Fixed the issue where placing some housing items in Olvia house 3-1 were not available. Fixed the issue where the actual amount of cannonballs crafted was different from the tooltip. Fixed the issue where the description of Perfume of Swiftness is incorrect. The particle effects of Ribbon Cat in the Pearl Shop preview display can not be seen or might look broken, this issue is only present in the preview window. This change was not intended to impact all loot drops from the listed regions only some, specifically we have seen people asking about drops from Pirate Island & Sausens, these items are unchanged. Fixed server issues??? I hope so.. Fix game memory leak issue when? Another one of "these" updates. Why????????? With all the thread about how desync affect their Ult and ridiculous one-shot capability of that ult??????? WoW, surprised you guys really got rid of the event items! WTB Plum Kr buff already.